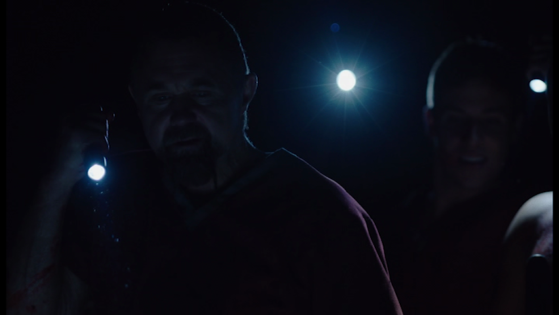 Death House is a 2017 horror film co-written & directed by B. Harrison Smith (6 Degrees of Hell, Camp Dread, Zombie Killers, & Dawn of 5 Evils). It was co-written & created by horror legend Gunnar Hansen (The Texas Chainsaw Massacre, Hollywood Chainsaw Hookers, Mosquito, & Texas Chainsaw 3D). It has the biggest cast ever assembled of horror icons from various productions in the same feature. A sequel is already planned & in pre-production called Dawn of 5 Evils. Farmer Asa (played by: Tony Todd from the Candyman franchise, Final Destination franchise, The Rock, & Hell Fest) gives a warning about an unspeakable place to an injured girl. Agent Toria Boon (played by: Cortney Palm from Sushi Girl, Zombeavers, Silent Night, & The Purge: Anarchy) flashes back to killing a mother & son to keep her cover intact while investigating neo-Nazi Alois Sieg (played by: Kane Hodder from the Friday the 13th franchise, Hatchet franchise, Alligator II: The Mutation, & Pumpkinhead II: Blood Wings). She ends up arresting the real life monster. She arrives at Death House where her rival is currently located. She meets Doctor Eileen Fletcher (played by: Dee Wallace from The Howling, The Hills Have Eyes, Critters, & Cujo) & fellow agent Jae Novak (played by: Cody Longo from The Last Movie Star, 48 Hours to Live, & Piranha 3D) there. Dr. Fletcher demonstrates their virtual reality technology (voiced by: Adrienne Barbeau from Swamp Thing, Escape from New York, Creepshow, & The Fog) to both agents where they run into Murderer (played by: Danny Trejo from Heat, Machete franchose, From Dusk Till Dawn franchise, & Death Race franchise) & Icicle Killer (played by: Sid Haig from Spider Baby, The Big Doll House, House of 1000 Corpses, & The Devil’s Rejects). They are introduced to Doctor Karen Redmane (played by: Barbara Crampton from Re-Animator, From Beyond, Chopping Mall, & Castle Freak) & they take a virtual tour of Death House. They learn about “The Five Evils” which include Hirace Giger (played by: Bill Moseley from The Texas Chainsaw Massacre 2, Silent Night, Deadly Night 3: Better Watch Out, Night of the Living Dead, House of 1000 Corpses, & The Devil’s Rejects), Balthoria (played by: Lindsay Hartley from Garlic & Gunpowder, Deadly Exchange, & Nightmare Nurse), Alexi Nela (played by: Vernon Wells from The Road Warrior, Weird Science, Commando, & Circuitry Man 1/2), Crau (played by: Michael Berryman from The Hills Have Eyes 1/2, Cut and Run, Weird Science, & One Flew Over the Cuckoo’s Nest), & Thile (played by: Vincent M. Ward from The Walking Dead). 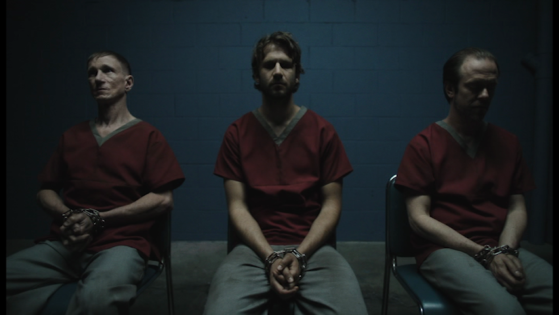 Doctor Bennett (played by: Richard Speight Jr. from Supernatural, Open Water 2, Demonic Toys, & Justified) shows the agents their research & experiments on the homeless. They go around & observe some of psychopaths locked inside who think they are connected to the devil. Doctor Challis (played by: Lloyd Kaufman from Terror Firmer, Slither, Orgazmo, & Crank: High Voltage) discovers the electronic device while performing surgery on the injured guard. 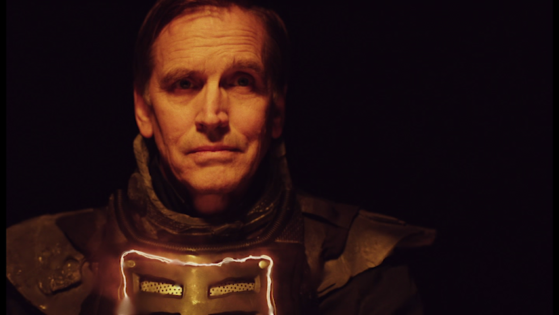 After removing the device, it triggers a power failure throughout the facility & the inmates with their leader (played by: R.A. Mihailoff from Leatherface: Texas Chainsaw Massacre III, Pumpkinhead II: Blood Wings, Hatchet II, & Trancers III) start killing everyone after they escape! All hell breaks loose, can the agents & doctors survive this brutal destruction???? Let’s talk about the positives for Death House. It has the best horror cast that I’ve ever seen in the same feature. The cameos here are amazing besides the main cast that I already listed above which include Camille Keaton (I Spit on Your Grave), Felissa Rose (Sleepaway Camp), Brinke Stevens (The Slumber Party Massacre), Beverly Randolph (The Return of the Living Dead), Tiffany Shepis (Victor Crowley), Debbie Rochon (Tromeo and Juliet), Elissa Dowling (We Are Still Here), Gunnar Hansen (The Texas Chainsaw Massacre), Tony Moran (Halloween), Ari Lehman (Friday the 13th), Sean Whalen (The People Under the Stairs), Larry Zerner (Friday the 13th Part III), & Bill Oberst Jr. (Circus of the Dead). It was awesome to see some of these horror icons share the same screen for a little bit. You got to see Jason Voorhees & Leatherface fight at one point also which was a geek out moment for any true horror fan. I will warn you that a decent amount of these appearances were very quick so if you blink or turn away you might miss a few of them. I really enjoyed the music, the score fit the tone of the production perfect. The practical old school special effects were great in this & it had some really brutal moments. So far as that goes, this feature definitely delivered but the rest of it was a complete mess. I thought the two leads were awful especially compared to all the talent they had around them. I think the producers picked the wrong person to take creative control over this ambitious project. It tried to be too high tech but they didn’t have the money to pull it off so it comes off super cheap & it doesn’t look good at all. The visual effects were really bad. It was incoherent, it didn’t make much sense for the most part. It was all over the place, nothing was consistent here. It felt more like a bunch of random scenes put together as a completed film. Both the writing & directing were very sloppy, Death House had so much potential & it didn’t even come close to it. I hope that the sequel is much better, they need to take their time & use their budget better because this was a disaster. Don’t get me wrong, it had some fun & entertaining material but I would never want to watch this again. Let’s discuss the special features on this DVD release from Cleopatra Entertainment! “Audio Commentary” with writer & director B. Harrison Smith. He talks about the opening being an homage to Psycho 3. He chats about how he got the gig for this. The producers approached him for it at his screening for Zombie Killers. He gets real excited about the cast when they show up on screen & he has nice things to say about them in all their amazing cameos in this. He does go more into detail about certain actors like Kane Hodder, Tony Todd, Dee Wallace, & Barbara Crampton. He mentions a potential sequel & he tells more backstory about the larger roles here. He says his previous film Camp Dread is in the same universe as Death House. He mentions that Jurassic Park was an inspiration for this. He points out several homages & easter eggs during the feature from other films. He geeks out when he talks about Kane Hodder going back to his Jason Voorhees roots for a gruesome scene. He jokes about changing the script on the actors & surprising them on the day of filming. He does lots of scene by scene commentary here. For some reason, he reminds me of Eli Roth. He’s very passionate about the horror genre & it really shows on the track. You can tell he had a blast making this feature. It has various short “Interviews” with director B. Harrison Smith, actors Dee Wallace, Courtney Palm. Barbara Crampton, producers Rick Finklestein & Steven Chase. B. Harrison Smith talks about how he first got involved with the project. He chats about working with Gunnar Hansen on the script. He brings up changes he made from the original source material. He mentions his two leads for Death House & their characters. The others mention their experience on the production & talk about their roles in Death House a little bit. The producers chat about putting together the film after all these years & they credited it all to Gunnar Hansen for the original concept. “Cortney Jumps” (Yes, it’s spelled that way on the menu!) is a 10 second clip of actress Courtney Palm doing a stunt. There’s an almost 3 minute “Slideshow” with a variety of photos from the production. 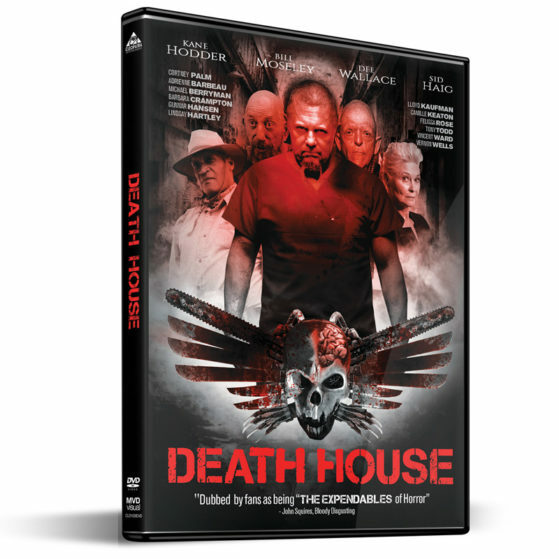 It has a “Trailer” for Death House. 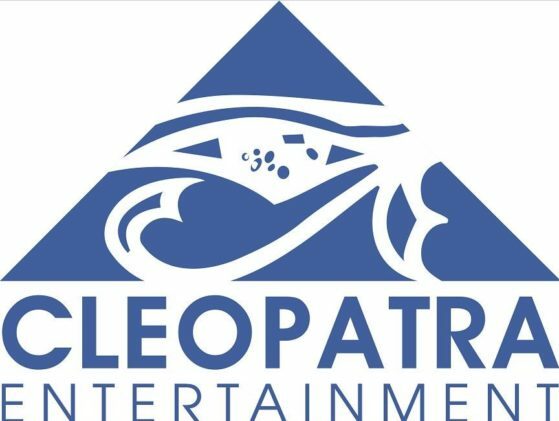 It also has several Cleopatra Entertainment related “Trailers”. It’s available everywhere right now!!! !